The city of Munich, Germany, is aiming to set a record. When the city reaches its goal of supplying 100 % of electricity demand from renewable energy sources in 2025, it will be the first city above 1 million (actual pop. 1,450,381 2015) inhabitants to reach that goal worldwide. Already today, 2.9 billion kWh per year are produced from renewable sources, exceeding the demand of all private households and the metro. Until 2025, the current share of 39 % is projected to increase to a 100% equaling 7.5 billion kWh/year and requiring investments of roughly 9 billion €. While projects in Munich and its hinterland are prioritized, the electricity will be produced by power plants located in Germany and Europe. Complimentary to the target of 100 % renewable electricity, Munich plans to supply 100 % of long-distance heating from renewable sources. The energy will be harvested from geothermal energy as well as biomass and windgas. 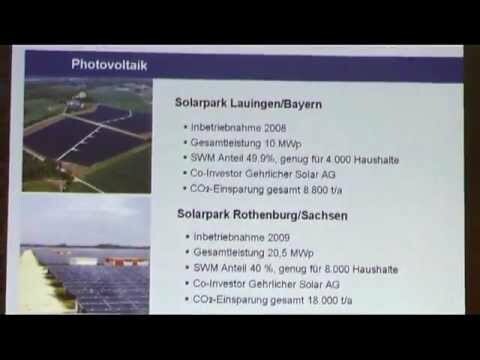 Bavaria’s capital has a long history of introducing policies to increase the share of renewable energy. Back in 1982, the city council asked the administration to push the use of renewable energy. In 2007, it was decided that the share of renewable energy was to be increased by 5 until 2020. As it became clear that this goal could be outdone, the 100 % target was set. Throughout the process, citizens, city planners and craftsmen have influenced the development which has increased public support of the policy. A crucial aspect that made the fast advancement of renewable energy possible is the fact that Munich’s public utilities are entirely in public hands which enabled the city council to pursue their ambitious plan. Even though the City of Munich prioritizes local and regional RE projects to reach the target, the area does not provide sufficient resources to supply the megacity with enough electricity. Munich’s public utility therefore also invests in several RE projects across Germany and Europe to offset the total electricity consumption against the total owned installed RE capacity.